Round Top Lake Sunset Your boy Al. Here Southbound backpackers exit the Desolation Wilderness. Well, hiking South of the Lower Echo Lake Trailhead brings us hiking across a short two mile segment of trail on the fringes of local civilization. Here we parallel and cross a couple of the main roads servicing the facilities and houses around lower Lower Echo Lake, and the houses scattered along these roads. The Desolation Wilderness boundary is actually North of Upper Echo Lake. Thus the houses around the lake and here between the South end of Desolation Wilderness and the North end of the Meiss Country Roadless Area. The Lower Echo Lake Trailhead is the Southern access point to Desolation Wilderness and the North-to-South exit point of hikers on the PCT, TYT, and TRT. We will not see great granite formations like those in Desolation again until we drop into Summit City Creek behind Round Top, if we are following the Tahoe to Yosemite Trail hiking South. 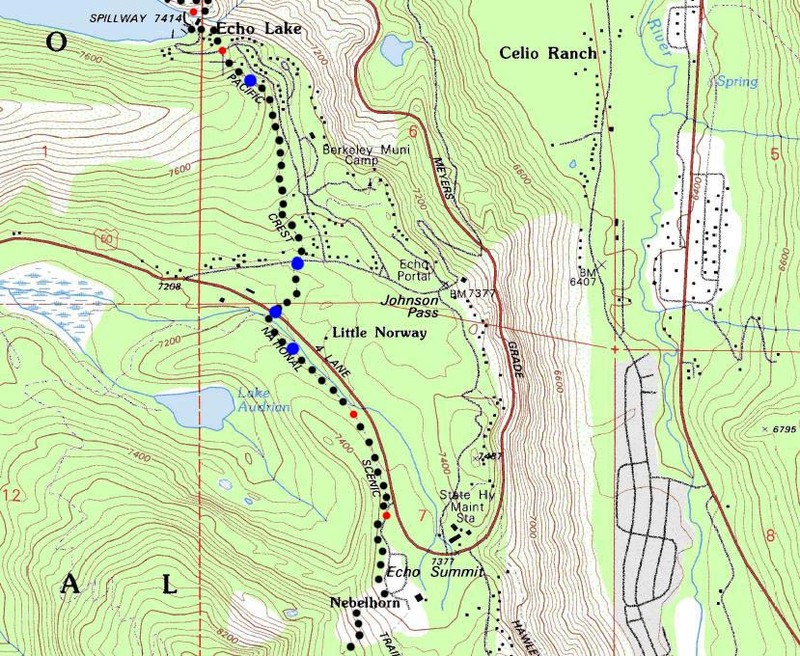 In any case, two miles separate the trailhead at Lower Echo Lake from the Echo Summit Trailhead. The first mile of the trail brings us through a neighborhood of National Forest and full time residences to cross Highway 50 just East of Little Norway. The next mile of trail South parallels Highway 50 East, up a fairly gentle grade to Echo Summit. Echo Summit is a trail head option for Southbound backpackers on the long trails South as well as an entrance into the Meiss Country Roadless Area for short backpacking trips. Beginning our trip South to Yosemite from Echo Summit trims 32 miles off of the length of our Tahoe to Yosemite Trail backpacking trip compared to beginning at the Meeks Bay trail head. Long distance backpackers have the option of hitch-hiking East to South Lake Tahoe for Rest and Resupply, if not resupply through the mail using Echo Chalet's Post Office-based resupply service. You should consider medium distance trips South from Echo Summit to Carson Pass, Ebbetts Pass, or Sonora Pass if you don't have the time to backpack from Lake Tahoe down to Yosemite or Mount Whitney. We can knock this thing out in sections. Those squares breaking the USGS maps up into grids are the Universal Transverse Mercator / Military Grid Reference System, otherwise commonly known as UTM. What's important for our general reference purpose is that each side of a square is 1000 meters, or a Kilometer. From my point of view that is 1093 yards or .62 of a mile. Diagonal: 1414.22 meters, if my trig is correct. That converts into 4,639.8 feet or .88 of a mile. Echo Lake and the Echo Summit trailheads are bisected by Highway 50 just West of Echo Summit. Echo Lake, Calif, 1992. 7.5 topographic. Meiss Country Roadless Area, the feds. Use search term "Meeks Bay," and "Address," as search type to locate this USGS map.